Now all your Special Collections have a home. Sometimes the experience is about more than Search. Unlock One Click access with support for multiple files and links. Records/Collections of all shapes and sizes are easily supported even if there is no standardized data format. All you need is a CSV with taxonomies that matter to you. Deciding whether a metadata element is a Record Detail or a Facet Filter is completely customizable by you on import. Quick rollback means no pressure. 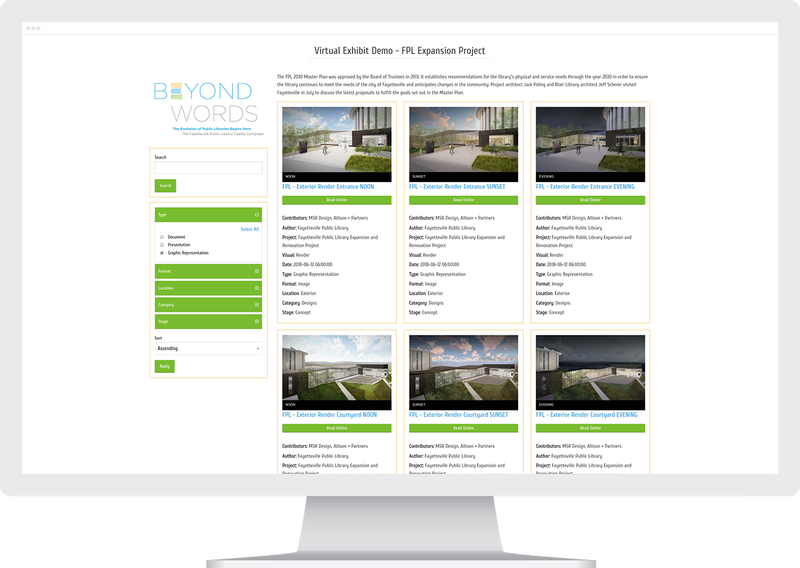 Collections can be themed separately from your website, ensuring your Virtual Exhibits are true to the brand of the particular Collection. Visual browsing of special collections creates a whole new opportunity to showcase those beloved memories. You deserve the ability to curate digital exhibits/displays of your collections the same way you would a physical exhibit. Now you can! Search your special collections alongside your discovery systems, catalogs, local and open content for a truly inclusive experience. You shouldn't need another tool to get the job done. All of your Collections are valuable and should be shared. Don't keep those special Collections offline, share them! Means less IT dependencies and more day to day control for you. Not sure where to start? Our Training Librarian can help map your Collections metadata. Need help branding a Collection? We can help!